With this product you can accumulate up to 28 Glitter Points. Reduces the appearance of wrinkles and fine lines;Increases skin firmness;Revitalizes the look. 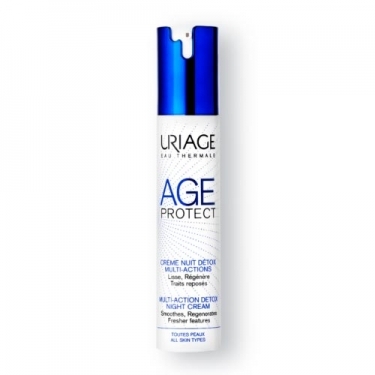 Age Protect Crème Nuit Détox Multi-Actions from Uriage is a velvety cream that acts on the signs of age and enhances the oxygenation of the skin. After use at night the complexion becomes more revitalized and luminous and the skin visibly softer. Night after night, the skin is regenerated, purified and its luminosity restored. It reduces the appearance of wrinkles and fine lines while fighting loss of firmness and lack of filling and also prevents the appearance of brown spots and restores the vitality of the skin. Enriched with Uriage Thermal Water and vegetable waxes and for a hydrated, flexible and smooth skin. Do not apply to pregnant women. In case of stinging sensation, space usage.